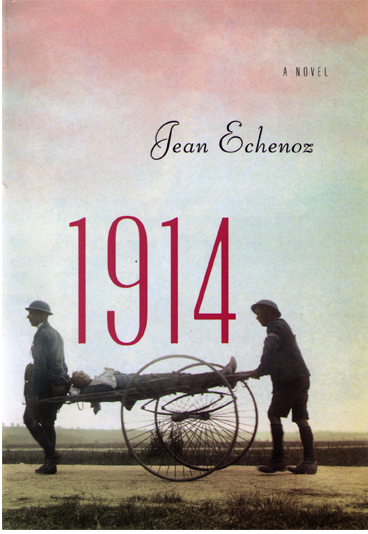 This month’s readalong title is the slim novel 1914 – 14 by prize-winning French author Jean Echenoz. He has won the Prix Médicis for Cherokee and the Prix Goncourt for I’m off – Je m’en vais, both prestigious prizes, and a number of smaller prizes as well. He’s been on my radar for a long while and when I saw he wrote a novel set during WWI, I was immediately tempted. To be honest, the book has received mixed reviews. I’m very curious to find out on which side I’ll be. Interestingly, the French title is 14 not 1914. One could probably discuss endlessly why they chose 1914 for the English translation and whether it’s right to change it like that. When I compared the beginning of the two books in French and English I noticed considerable differences. Those who read it in English, will have to tell me what they think of the translation. Since the weather was so inviting and it was Saturday, a half day, which allowed him to leave work early, Anthime set out on his bicycle after lunch. His plan: to take advantage of the radiant August sun, enjoy some exercise in the fresh country air, and doubtless stretch out on the grass to read, for he strapped to his bicycle a book too bulky to fit in the wire basket. After coasting gently out of the city, he lazed easily along for about six flat miles until forced to stand up on his pedals while tackling a hill, sweating as he swayed from side to side. The hills of the Vendée in the Loire region of west-central France aren’t much, of course, and it was only a slight rise, but lofty enough to provide a rewarding view. Jean Echenoz turns his attention to the deathtrap of World War I in 1914. Five Frenchmen go off to war, two of them leaving behind young women who long for their return. But the main character in this brilliant novel is the Great War itself. Echenoz, whose work has been compared to that of writers as diverse as Joseph Conrad and Laurence Sterne, leads us gently from a balmy summer day deep into the relentless – and, one hundred years later, still unthinkable – carnage of trench warfare. The discussion starts on Thursday, 31 March 2016. Further information on the Literature and War Readalong 2016, including all the book blurbs, can be found here. I’m not doing terribly well with readalongs and events this year, but I’m super keen to hear your thoughts on this novel (and Echenoz in general). One of my NYRB Classics editions contains an intro by him. I have a feeling it’s Fatale by Jean-Patrick Manchette (which I loved), so he’s definitely of interest to me. I’m really keen on reading this. I only hope it’s as good as his others are said to be but it’s so short. I’m not really worried. I’ll try to take part in this readalong, Caroline! This book is on my shelves for ages, and everyone keeps telling me how good it is :). That’s so great, Juliana. I’m looking forward to the discussion. I’ve heard very positive and not so positive things. It will be interesting. Won’t be able to join, but I like novels set in WWI, so will probably add this to the pile. I look forward to the discussion. It should be an interesting book. Yes, I agree. Have you read any of his books? It would be great if you could join. It’s a short book. That would be so great. Yay. I find it a little troubling that the English translation is so different from the original. I always have this concern when reading translated material. I agree. I would have to compare more to be sure but it felt different. I read this when it came out in English – I really like Echenoz. Was surprised it couldn’t find a UK publisher given it was the hundredth anniversary of the war! That’s strange. I’m really keen on reading it. This looks like a wonderful book, Caroline. It is sad that they changed the title in the English edition. I sometimes have a problem with British translators (I am guessing the translator of this book is British), because they try to translate more than required and make things explicit to the English reading audience. In my opinion, it insults the audience’s intelligence. I guess in this case the translator / publisher thought that 1914 would make the reader know that it is about the First World War, but 14 on its own wouldn’t mean much and might affect the sales of the book. Unfortunately, it this change takes away some of the power and possible interpretations of the title. (I remember Hans Fallada’s book ‘Every Man Dies Alone’ was translated as ‘Alone in Berlin’ in the British edition.) Happy reading! I will try to join in this month. You take the words right out if my mouth! I thought it did insult the readers intelligence. Many of the things they added do. I’m looking forward to the discussion.